While President Trump is putting the kibosh on a cost of living adjustment pay raise for federal workers, there are a bunch of people working in “non-profits” doing “quasi-public” work getting paid outrageous salaries with little or no oversight, spending your tax dollars like it’s play money. The proliferation of these types of organizations in Southwest Ohio has been unchecked, and even when they are intimately connected with devastating losses of public money, like in the case of Wright State, no one is held accountable. The “watchdogs” sit on the sidelines as these foxes not only ravage the hen house, they burn down the farmers house, steal the horses, auction off the farm equipment that they bought from their friends who make large campaign donations, and then spend more tax money to continue to do the same thing without fear of prosecution, prison time, personal accountability or even a slap on the wrist. Need an example to get you started? 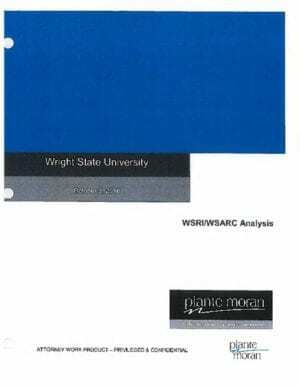 From the Plante Moran Audit of Wright State University. This was a $300K study done to try to figure out who profited from the H1B visa scandal and how Wright State went from fiscally sound in 2010 to broke by 2016. At WSRI, we harness the creativity and scientific ability available throughout Wright State University to provide our commercial and government partners a mechanism for collaborating on open, proprietary, or classified projects. The $4,000,000 installments payments will bear Interest at an agreed upon rate. Last I checked, an $11M deal would be something that would have to have approval by a board of trustees. But, no worries, the next thing you know- the deal is terminated. Sorry, we were off by almost double. No deal. WSARC represented not to have the valuation documentation onsite because they were required to return it or destroy per a nondisclosure agreement (“NOA”) entered into ahead of the potential transaction. The key here- Sebally Shillito & Dyer named partner, Bev Shillito, was on the Board of Trustees of WSARC ATIC at the time, and profiting from legal bills in the amount of $17,405 for legal work- to blow $150K on a deal that not only is missing proper records, the check that was used to pay the bill was recorded improperly. She’s also on the Board of ATIC which, despite being a totally separate 501C3 filing a separate 990- also- paid her firm $17,405. Now, are these separate organizations- or all the same? Or did she just send bills out to all the organizations she was on the boards of for the same amount? ATIC and WSARC had the following people on both boards: David Hopkins, Dennis Andresh, S. Narayan, Jeff Hoagland. The Dayton Development Coalition board had the following cross pollination with ATIC: David Hopkins, John Landess, Michael Bridges, Jeff Hoagland and Al Wofford was on WSARC. Bridges was a WSU Trustee, and future WSU Trustee Doug Fecher was on the DDC board. The DDC’s sub-non-profit Development Research Group has Fecher, Landess, Hoagland, and Rich Marseca who is the secretary of WSARC. The DDC’s other sub-non-profit- Development Projects Inc has Fecher, Landess, Hoagland, Maresca. As you can see- it’s a veritable web of interlocking directorates. This isn’t the first time Bev Shillito has driven public money into her pockets and played politics. She’s a part owner of Real Art, and they did most of the work for the Dayton Development Coalition of which she was on the board at the time. Sometimes the work came to Real Art from Congressman Turner’s first wife’s firm- “Turner Marketing” or “Turner Effect” which was well documented on this blog. The campaign “Get Midwest” was not only bad, but costly- sort of foreshadowing of what was to come at Wright State. Nice money if you can get it. The interesting part of the agreement, that proves that all these non-profits are nothing but a shell game, is that Andresh in his Letter of Intent is making assertions of $4M being credited through the Foundation- an organization that is supposed to be separate. Despite there being rules in place to supposedly expose and limit interlocking directorates and self-dealing, there is no legal authority that is charged or responsible for enforcing them. Why WSARC was buying a drug research company was never disclosed. We don’t really know what WSARC is supposed to be doing, because, well, despite all of its funding coming from WSU, and its employees being paid by WSU- somehow, they claim WSARC is exempt from the Public Records laws. Dr. Bernadette D’Souza, the owner of Midwest Clinical, is yet another retired Air Force officer finding their way to the quasi-government non-profit feeding trough. The only job creation and economic development going on, is their personal enrichment by privatizing what should be public service operations under the cover of a tax structure created for charity- the 501(c)(3) organization. And, the money is good. Hugh Bolton, another retired Air Force academy grad, and the head of the now defunct ATIC was paid $429,956 according to the 2011 form 990. Just for comparison- that’s more than the President of the United States makes by $30K. Bolton. Around the same time that Andresh was contemplating buying Midwest Clinical, he also chose to sign an operating agreement for ATIC bringing all their employees into WSARC. • 2011: Base compensation of $249,314, bonus and incentive compensation of $72,644 and retirement and deferred compensation of $107,998, with total compensation for the year of $429,956. • 2012: Base compensation of $242,611 and bonuses of $237,572, with total compensation for the year of $480,233. • 2013: Base compensation of $205,416, with compensation total compensation for the year of $205,416. Our analysis of ATlC’s disbursements also identified related party payments made by ATIC. • From 2011 to 2014, ATIC paid over $140,000 to Sebaly, Shillito, & Dyer, a law firm at which Beverly Shillito is a Partner. Beverely Shillito was also identified to be ATIC’s Secretary. So once again, a “trustee” is making money and public money is being used like monopoly money. There will be more articles coming about ATIC, outlining how Mills Morgan, the company that built the building had no problems selling part of the building to ATIC, but, somehow, when the building was sold as part of a package for $17M– WSU got stiffed for $1.3M thanks to a questionable deal they entered into in December of 2016. To cut costs, ATIC recently purchased 26,000 square feet of 2685 Hibiscus Way in Beavercreek — for $4.78 million from Mills Morgan. ATIC now owns all 38,000 square feet of the building it occupies. “It provides us monthly savings that we can invest in new programs and continue to grow,” Bolton said. The rest of the building is still owned by Mills Morgan and leased to other organizations. WSARC issued a note receivable to Advanced Technical Intelligence Center for Human Capital Development (ATIC) on December 1, 2016, for $1,404,119. The note is secured by a fourth mortgage interest in real property owned by ATIC (property) located in Greene County, Ohio. The note bears interest at a per annum rate of 1.29%. Monthly installment payments of $2,500 are due until the earlier of December 31, 2021, or the date ATIC sells the property, at which time the entire then-remaining principal balance and accrued and unpaid interest are due in full. More will be coming on how Bob Mills- who built a basketball practice facility for WSU- somehow keeps coming up on the sweet side of smelly deals involving the WSU shell company Double Bowler Properties Group, Wright Patt Credit Union, headed by WSU Board of Trustees president Douglas Fecher, and the seemingly teflon coated WSU econ professor, Robert Sweeney who is also on the board of trustees for WPCU, and served as the Secretary to the WSU board of Trustees through the whole money loss. Sweeney also shows up on other boards- including the Miami Valley Research Foundation (2015-2016) where WSARC did another odd deal for real estate- normally the purview of Double Bowler Properties. On June 26, 2015, WSARC converted a $300,000 note receivable from the Miami Valley Research Foundation into an option to purchase a proportionate share of approximately 125 acres of land located in Greene County, Ohio. The option expires on June 9, 2019. If the option is not exercised, the $300,000 consideration paid will be returned to WSARC. By offloading public money into these shell companies, which make claims of doing things that government “isn’t really set up to do” we create vessels for public money to flow into private hands outside of the purview of public scrutiny offered by the “Sunshine Laws” which were created to keep back room dealing out in daylight. Ever since their passage in the mid-1950’s in Ohio, the schemes to circumvent these laws have grown in complexity and number, with many of these operations setting up multiple “non-profit corporations” to effectively shuffle money between themselves, mostly with the same people in charge, but different books so that tracing the flow of money is nearly impossible. From “non-profit” hospitals that shut down in poor communities whilst building empires in wealthy ones, to totally tax funded health care companies having their own “charitable foundations” where employees are forced to donate to, in almost every case a “favored son or daughter” of the community is put in charge, paid a six-figure salary ($200K yr) to “administer” charity. This is a long way from the model of charity established by folks like Mother Theresa. For the most part this is a tax-dodgers playground for the ultra-rich to make sure the machine is well oiled at funneling public money back into their private accounts, so the money machines keep running. We’ll be looking at how much running some of these non-profits pay their chief executive officers in a future post- along with their interlocking directorates. If Blockchain and Bitcoin are the new ways to move wealth outside of government eyes, these quasi-public non-profits are the old way. And with the Supreme Court ruling in Citizens United where “corporations are people too” allows private corporations to fund campaigns for public office, we have crafted whole new ways to corrupt the democratic process with huge amounts of untraceable campaign cash to support those who allocate our tax dollars. Journalists are always given the first rule of reporting- “follow the money” and in most case it leads the story to the inevitable discovery that people are still cursed with greed as a primary motivator- and what better pot of money to go after than “government money” since in the end- with the Federal Reserve system not being tied to anything like “inventory” or “tangible” assets- the types of things the rest of us have to have in order to borrow or make money, the fed is a virtual slot machine made for those who control the programming. In addition to the Maric Management fees, Advratech also loaned $50,000 to Maric Management during 2014. Per Advratech’s check register, the loan was made in September 2014. Advratech reported interest income of $3.85 for the year ended December 31, 2014 and $167.29 for the six months ended June 30, 2015. The balance of the note receivable for the loan remained at $50,000 as of June 30, 2015. While the information provided did not contain details regarding the terms of the loan, the annual interest rate for the loan calculates to less than 0.7% based on six months interest income of $167.29 on $50,000. Shareholders of Advratech may find it concerning that nearly interest free loans to a related entity are being made at a time when minimal/zero distributions are being made to the investors. This was around the same time that WPCU CEO Doug Fecher joined the board of trustees. He had just completed his deal to sell Double Bowler Properties his old HQ, and move into a Mills Morgan building. It’s funny- but, I just contacted WPCU for a $50K loan backed by my office building and was told that there is $3K in origination fees and at least 6% interest. Must be that I’m not paying off the “Wright” people. Our monetary system isn’t measured in millions or billions, it’s in trillions, making it easy for rounding error in deals enough to make some people very wealthy. It’s the ultimate confidence game- and there are entire industries built around crafting their own playgrounds with their own regulations so they can cash out their piece of the pie. If you don’t realize that FIRE- Finance, Insurance and Real Estate, all are huge contributors to political campaigns, and that they have their own rules and regulations passed to keep their ability to extort money at every turn, you’ve been asleep for the last decade. Locally we’ve seen our economy move from a manufacturing base where we made real things like cash registers, paper products, refrigerators and pickup trucks to now being dependent on “Meds, Eds and Feds” – (Medical, Educational and Federal) which unfortunately don’t pay taxes for the basic services required to keep firemen and police on call, trash picked up, clean water delivered to your tap and streets that are well maintained and smooth. And in that mad rush to keep those Meds, Eds and Feds happy- we’ve sold out the general public and their bank accounts to create an army of “non-profit” middle men who’ve been robbing us blind for years and telling us we’re making progress. 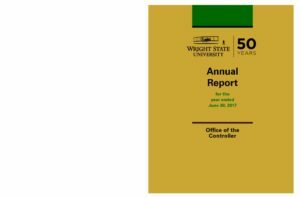 Wright State is on the verge of financial collapse because of it, yet not a single person has been brought up on charges, and the same people running the show as it crashed into the ground are still the ones in charge and being trusted, to fix it. The foxes (the Wright State Board of Trustees) are now crafting a revisionist history of how they saved the institution and its many shady shell corporations that they created, profited from and continue to profit from because nobody will call them out. That they had an hour meeting with Dennis Andresh on Dec 13, 2018- where he was proudly explaining how he’d now put a bunch of controls on his out of control organizations clearly proves that WSARC is clearly a part of WSU and not a separate organization. And instead of congratulating Andresh, they should have fired him long ago, and held him accountable for the giant sucking sound of money leaving WSU to his little side business/shitshow that’s still of questionable value to anyone but someone running a shell game. Listen to the interview I did with General C. D. Moore off camera after the meeting- the last 5 minutes, to hear him admit that in 2014 the WSU board wasn’t doing its job. The only watchdog that can be trusted to do this, unfortunately, is publicly supported journalists, (or even unpublicly supported like me) who should be technically unbiased by the power and influence of these huge dollar institutions. Unfortunately, the local newspaper is on life support as more advertising dollars have been siphoned off by Facebook and Google (technically- Alphabet, Google’s parent company). If you look at the money expended by the two major health networks for advertising with CoxOhio- and then realize that being the sole recipient of public money as the journal of public record, and throw in diminished subscription income as the newspapers value has reduced as its usefulness is marginalized, and you have the perfect storm for unbridled theft and cursory investigation into what really happened at Wright State and how it came to be. And, as we’ll dive into it over the next days and months, you’ll see how the few scapegoats that have been blamed were barely pawns in a game of chess that’s more complicated than what even AlphaZero (the current chess playing master computer) could deconstruct. I trace the beginnings of these quasi-public non-profit slush funds back to as early as the mid-seventies. And while you might know some of them, the rate of proliferation in the last 10 years has been exponential.